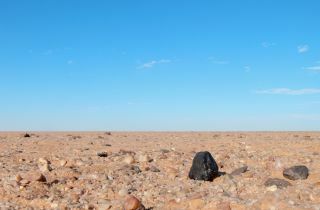 The black fragment of Almahata Sitta meteorite number 15 shows up black against the lighter coloured rocks of the Nubian desert in northern Sudan. Meteorites that fell over Sudan in 2008 could have come from a space rock that was formed by a triple-asteroid pileup — a collision between three different types of space rocks, a new study finds. Scientists analyzed meteorite fragments that fell to Earth exactly three years ago today, on Oct. 7, 2008, and found that they contain an unusual mix of material from both primitive and evolved types of asteroids. "Because falls of meteorites of different types are rare, the question of the origin of an asteroid harboring both primitive and evolved characteristics is a challenging and intriguing problem," study leader Julie Gayon-Markt, of the Observatoire de la Cote d'Azur in France, said in a statement. The shape of Asteroid 2008 TC3, a small space rock that hit the Earth in Sudan in October 2008, has been revealed to be something akin to a loaf of bread. "Our recent studies of the dynamics and spectroscopy of asteroids in the main asteroid belt shed light on the origin of the Almahata Sitta fragments," Gayon-Markt said. "We show that the Nysa-Polana asteroid family, located in the inner main belt is a very good candidate for the origin of 2008 TC3." Primitive asteroids are so called because they are survivors from the tumultuous birth of the solar system and have remained relatively unchanged. These asteroids contain high proportions of hydrated minerals and organic materials, the researchers said. On the other hand, many other asteroids have undergone intense heating, most likely through the decay of radioactive materials, and the molten magma has separated into an iron core surrounded by a rocky mantle, the scientists explained. The research was presented today (Oct. 7) at a joint meeting of the European Planetary Science Congress and the American Astronomical Society's Division of Planetary Science in Nantes, France. Infrared image taken by the Meteosat 8 satellite of asteroid 2008 TC3 exploding. The path of the asteroid is shown with a yellow arrow; red-yellow blob on arrow is infrared from the explosion. The Nysa-Polana family of asteroids, located in the inner main asteroid belt, is divided into three different types: the primitive B-type asteroids, which are relatively rare, stony S-type asteroids, and intermediate X-type asteroids. Both S-type and X-type asteroids have undergone some kind of thermal evolution in their past. Gayon-Markt and her colleagues found materials from all three Nysa-Polana asteroid types in the Almahata Sitta fragments. Their findings suggest that asteroid 2008 TC3 formed from the impact of an S-type object in the inner main asteroid belt with a B-type object from the Nysa-Polana family. This was followed by a second impact with an X-type asteroid also from the Nysa-Polana family. "Around seventy to eighty percent of the Almahata Sitta fragments are what we call ureilites," Gayon-Markt said. "Although ureilites show both primitive and evolved characteristics, their spectra in visible light are very similar to B-type primitive objects. The remaining 20 to 30 percent of the Almahata Sitta fragments gather two other kinds of meteorites which are linked to S-type and X-type asteroids. A workable explanation for how asteroid 2008 TC3 could have formed involves low velocity collisions between these asteroid fragments of very different mineralogies."